LOVE this dress! Fit a little bigger when u do custom but rather have it bigger than smaller and looks just like the picture! Thank you azazie! I fit measurements for a regular size exactly and it fits great. My concern is how many sequins fell off in the 5 minutes I had it on to try it on! I will be very curious to see how many are left at the end of the night after wearing it for a wedding. Was hoping I'd get to wear it again...but I am highly concerned about the condition it will be at the end of the night. Also, because of this, there really would be no way to clean this other than spot treating. Seems good quality other than that. Can't beat the pricing! I was able to get it on sale for Cyber Monday as well. Didn't give my bridesmaids the best shape. Beautiful dress. Good quality. This dress fits perfectly and true to size. The only thing is that if you or your bridesmaids have a large chest and hip area I feel that this dress is not slimming. Thank goodness I tried this on before ordering. If you're petite, this is not the dress for you. It looks gorgeous on the model but will swallow you up if you're petite. I ordered the swatch which came out pearl pink and pretty like the image shown; however, the dresses I received were rose gold. I’m pretty upset thinking about it now when I look at the photos of the gal on the website because I really do want the pearl pink look rather than the rose gold..... but I ordered half custom sized dresses and some regular sized. Most came out larger around the bust area for the bridesmaids. This dress is amazing! 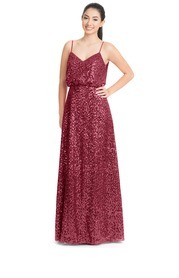 It's so sparkly the quality is fantastic:) this dress is super flattering on many body types. The sample dress came super fast within like 4 days and it was in excellent condition! I would highly recommend this website to anyone:) In the picture my cousin is wearing a size 8 and I think she's usually around a 6 in street size.